At this age, my twins are more receptive towards routine. Day in and out, we have established certain routines in order for them to have better sleep patterns. I guess, this is also one thing that we made sure to have as taking care of twins is no walk in the park if you're not organized or have not done any routine to get them accustomed to their daily schedules. Next, we wind down by placing them in their play mat. No more TV, lights are dimmed and we just allow them to burn out the last bit of their energy in order to have a better, uninterrupted sleep. During this time we'd read one of their books or it would be story time. Oh, my twins love story time most especially my little girl L. Her eyes would sparkle as I turn each page and we would stay there for a minute or two as she would really look at the drawing on that particular page. Often times, she would babble and I'd take the opportunity to say some easy key words for her to absorb. After story-time, then we pray and off they go to bed. 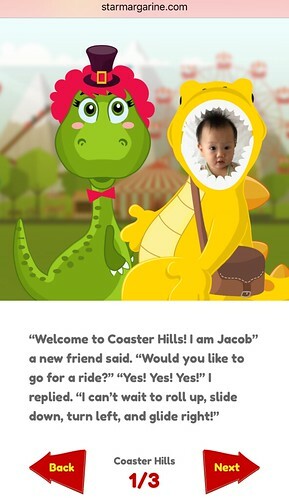 Recently, I was introduced to Star Margarine's latest digital storybook and during one of our morning play time, I introduced this to the twins. 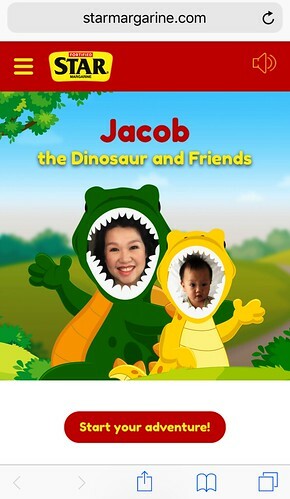 One thing that caught their attention is the fact that the screen shows my face on a Mommy Dino body and Jacob's face on the Baby Dino body. L excitedly pointed on that screen and started babbling showing that she recognizes those faces as I told them the story. I loved the story! It's actually short and easy to read which is perfect for my twins as they do not have long attention spans at the moment. Since they're really young, I took charge of leading where the story should go. Perhaps if they're much bigger, I'd let them choose as it would be nice to read various variations of the story depending on their choice. If there's one thing that I really hope I can do regularly is to do story-telling sessions with my babies. Not only is it a good way to bond but it helps enrich their young minds too. I love seeing how they would react to the different visuals and they would give our sounds as if they're responding to the story too. Try creating your own story at Star Margarine's website and start your story-telling sessions today.